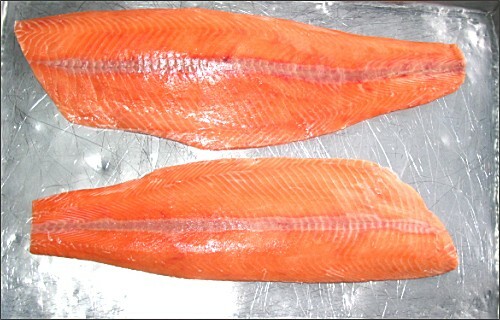 Atlantic Salmon - Flesh pink/orange colour, firm but good flaking texture. Salmon fillets are good for sashimi. Salmon steaks have small bones inside. 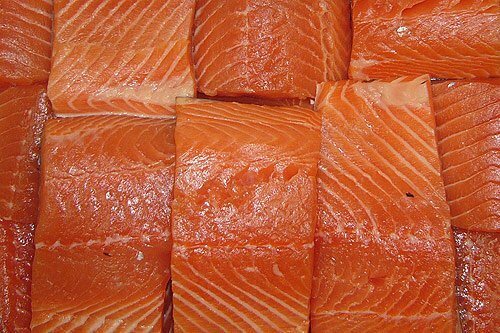 Atlantic Salmon is sold whole or as cutlets or fillets. Excellent smoked or as sashimi. Smoked salmon paté is very good. Overall very good eating, although it can be dry if overcooked. The best food sources of vitamin D are oily fish, especially catfish, mackerel, and salmon. With a vitamin D content that measures between 350 and 425 IU, a single serving of one of these fish can approach or even surpass one’s recommended daily D target. Those who do not like fish or who simply wish to ratchet up their vitamin D intake should consider taking a daily dose of cod liver oil, which packs almost 1,400 IU of the nutrient in every tablespoon. Pale to dark pink. Reddish pink.